Time to celebrate – something to smile about. A good time to take stock and reflect on what has been achieved in the project so far. Those of you who have been with us from that very small beginning at the end of 2006 will remember that, when I stumbled upon this project, there were 28 children in a dingy room, sitting on three benches, being taught by two Rwandan volunteers without resources, toilet facilities, play area, and in danger of closure. In January 2010, just three years later, the school will open with six classes – three nursery and three primary, with an average of thirty children in each class. We will be employing twelve people, teachers, classroom assistants, a cook and two guards. 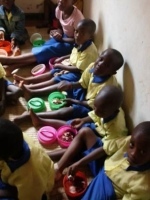 Our feeding programme started with the children receiving daily porridge. 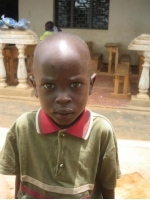 We began, in 2009, to feed 10 of the most needy children a meal of rice and beans at mid-day. That meal now includes soya flour for added protein and some vegetables. The house we bought in July 2008 has been adapted to provide some classrooms, an office, a food store and some volunteer accommodation. We have built our eco-toilets and finished the boundary wall, entrance gate, guardhouse and garden at the front, and a secure fence at the back of the property. 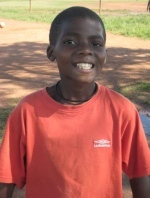 In addition to the school for the young children, our programme for adults has grown and expanded. We began in 2007 with hairdressing classes. A number of those students now work in salons in Kigali, or from home. Students from our basket-making classes can now earn money with their new skills and the products are sold locally and abroad. Classes in jewellery and bead-making have given others a chance to learn a new skill. Our products are sold in the Kigali Memorial Centre and abroad also. Our tailoring classes, funded originally by the Globalgrassroots Organisation, have trained 90 students to a high standard. Some of the graduates have formed their own small businesses, or work from home and 30 members have founded a co-operative which we hope will be set up with the support of OXFAM Germany in 2010. They supply goods locally and have recently received an order from outlets in the USA. Our Literacy classes for men and women have enabled people to take more control of their lives, given them confidence and provided a strong self-support network. As our work has become more widely known, we have benefited from an increasing number of short and long-term volunteers from across the world. These volunteers have provided energy, expertise and support in many ways – teaching English, teaching the children in school and in the holidays, giving business and management help, teaching a photography project. My grateful thanks to Brittney, Kathleen, Vincent, Gemma, Jules, Rosas and Karen, who have worked with us this year. We have become very well known in the local area now and I believe we have made a huge difference to many lives here. This local umudugudu, or village, is called ‘urugero’ which means example, and I think that what we have achieved is an example of just what can be done, given the will to co-operate and work together. Our plans for the future include :- the building of a kitchen, the refurbishment of buildings to make more classrooms, the development of a women and children family health programme, an increase in the basic literacy classes, perhaps English classes in the evenings (at the request of parents so they can help their children with their homework!) and the addition of more primary classes. There is new information on our website now, I hope you will find the time to take a look. Meanwhile, a few pictures from this year at school. None of this would have been possible without the financial support of individuals, schools, groups and organisations in many parts of the world. It is not possible here to list everyone who has helped us. People have done amazing things to raise money for us, and I hope they have enjoyed the events and adventures they have organised. Whatever your contribution has been, whether by financial donations, by giving your time and expertise, by helping with organisational things at home in the UK or in Rwanda, you should know that you are making a real difference and that we are very grateful to you. Thank you for your continued kindness and generosity. In a world where there is so much agony you will find a small place in Kigali where there are smiles, hugs, laughter, companionship and people working together to build a future for themselves. You have helped to make this possible. Finally, four pictures – of two children on the feeding programme – which I think will demonstrate the difference you are making. On behalf of our community in Kigali I thank you very much. 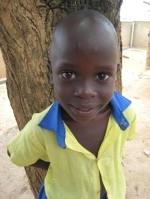 Sponsor a child from just £20/$30 a month. Find out more here.